your small or mid-size business. No other MSP in the NYC / NJ area can match our response time, provide the breadth of knowledge, assign you a dedicated engineer and deliver technology solutions that work exactly the way you want them to. We won’t just promise you great service, we promise you’ll tell your friends about the great service we provide. At Fiver Rivers IT we believe that IT Solutions are the tools needed to run your business and should not become your business. Complete the form below to claim your FREE Technology Assesment Today! WE’VE GOT YOUR BACK REDUCE EXPOSURE. MITIGATE RISK. For small to medium size businesses, Five Rivers IT offers a completely outsourced IT services model for your small or mid-size business. In addition to managing your network, we also provide end-user support for day-to-day computing issues. We are highly flexible and can perform these services either independently or in tandem with your current IT staff. Our strengths include: analyzing your network for security risks and helping you implement a mitigation strategy to address them; optimizing your IT operations and reducing costs and exposure by providing you with the latest technologies available. AIM HIGH. REACH YOUR BUSINESS OBJECTIVES. Cloud technology is the foundation that makes other digital technologies, like social media, mobility, big data and data analytics possible.Five Rivers IT has the know-how, assets(two datacenters) and skills to help you migrate to a private hybrid or public cloud (Amazon, Azure), without disturbing legacy technologies. Some of the benefits to migrating to the cloud are greater agility, lower costs and a highly flexible, scalable infrastructure. Whether you are looking for a traditional phone system solution or a Voice over IP (VoIP) solution, our experienced team can assist you in designing and implementing the right solution for your business. We design, integrate and install flexible, feature-rich business telephone system solutions from the world leaders in networking and communication technology, that can combine Voice over IP (VoIP), SIP trunking, IP telephony, IP fax, wireless, collaboration, IP, digital and analog into a single platform, enabling you to deploy a traditional telephone system, IP telephony, or a combination of both - when and where it’s right for your organization. Five Rivers IT - We don’t just promise you great service. We promise you’ll tell your friends about the great service you receive from us. 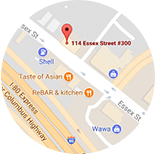 Being in business for over 10 years we are respected leaders in our communities, HQ’d in Rochelle Park, NJ with offices in NYC covering the entire Tri-State area. We assign each customer their own dedicated engineer based on services and skill set. We provide our clients with the best IT architects, infrastructure solutions, data management and cloud services available. 17 Engineers on staff. Collectively our engineering team brings a breadth of knowledge that is second to none and have the certifications to show for it. We are a leader in this space offering the latest technology and security tools while providing the professional expertise of our CISSP Certified Engineers. We address your issues within minutes not hours or days. Providing 24 x 7 support with multi-tiered staff to ensure that any hiccups or challenges are handled swiftly and without any downtime. We offer strategic planning, project management and technical services that enable you to garner control of your IT systems. From conducting comprehensive requirement analysis to providing custom tailored solutions, We are ready, willing and able to meet all of your technology needs. Having multiple offices and geo-redundant data centers gives our customers peace of mind that we are right around the corner if needed and a competitive edge over the competition. Ongoing education and trainings keep our Engineers up to date on the cutting edge and latest technology trends. We continue to invest in the tools necessary to provide the highest level of service to our customers. Our experience and expertise allows us to provide a robust industry leading portfolio of services and our strategic partner network allows us to provide Cabling, Surveillance/Camera Recording Systems, Network Services and Telephony Systems. They designed and managed all aspects of technology for our new office. We had no surprises and everything was done well within the budget. Vice President, Eurostar Belgium Inc.
We have completely outsourced our Network Management and user support to Five Rivers IT. All our users are very happy with the white glove service they get for their IT related needs. Five Rivers IT is a dynamic group of IT professionals who believe in proactive support. They are very thorough with their approach and always follow through. Five Rivers IT strives to help businesses drive productivity, maximize value and increase reliability within their IT infrastructure. We accomplish this by providing our clients with the best IT architects, infrastructure solutions, data management and cloud services available. We offer strategic planning, project management and technical services that enable you to garner control of your IT systems. From conducting comprehensive requirement analyses to providing custom tailored solutions, Five Rivers IT is ready, willing and able to meet all of your technology needs. So our combination of technological expertise and business acumen -- motivated by a desire to provide faster, more effective, more affordable services and solutions than NY/NJ’s other IT providers -- keeps customers coming back for support time after time. And our methodology to Assess-Design-Deploy-Manage ensures consistency and cost-effectiveness that you’ll be sure to appreciate, too. Get in touch today! Not a problem, we totally understand that there’s lots to think about when choosing an IT support provider, especially since they’ll be the one protecting you from cybercrime. So while you’re conducting your research -- and to say thank you for considering our services -- we’d like you to have our FREE eBook detailing the most common ways cybercriminals attack and how to protect yourself. 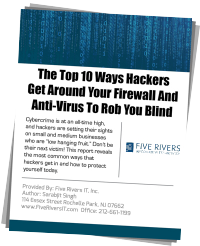 Five Rivers IT’s easy-to-read report, The Top 10 Ways Hackers Get Around Your Firewall And Anti-Virus To Rob You Blind, is an overview of the many methods hackers employ to infiltrate your network to steal sensitive financial information like credit card numbers, social security numbers, and passwords to your bank accounts! But don’t be fooled: just because your business is a small business, that doesn’t mean it’s not a target, so expert guidance is advised to make sure you’re not a sitting duck. And the best part is, we’ll deliver this informative report straight to your inbox, for free, with absolutely no strings attached! 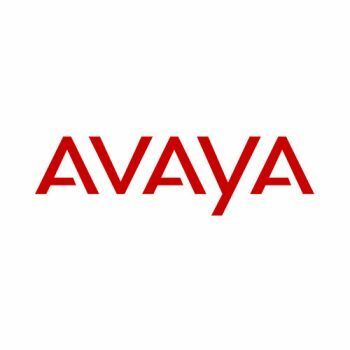 We’re Proud To Partner With The Best Technology Companies In The Industry.